My little sister is a summer camp counselor. I admire anyone who can do that sort of work, but in this record-breaking heat I admire it even more. Sadly, though, I’ve been a delinquent older sister and haven’t even sent her a letter this summer. So this week I tried to make up for my bad form and put together a little care package. Along with some sweet treats, I thought she might like a new summer tank. I have a pile of fantastic knit fabric from Vogue Fabrics that I’ve been eager to use. I raved about these fabrics here already, but I’m going to rave again. It is a tissue weight fabric and may not drape as well as I’d like, but the fact that it was only $3.00 per yard made it easy to just dive in and create something with little trepidation. It’s those expensive fabrics that keep me up all night, worrying about all the ways I’ll manage to ruin them. Fearless and with my lovely fabric in hand, I first drafted a tank pattern, then started cutting. I’m actually a bit surprised at how easily it all came together. That’s the glory of gridded pattern paper, a chalk pencil, a French curve and a well-loved existing tank. As someone who used to think she could just eyeball things, let me tell you how important the right tools are. 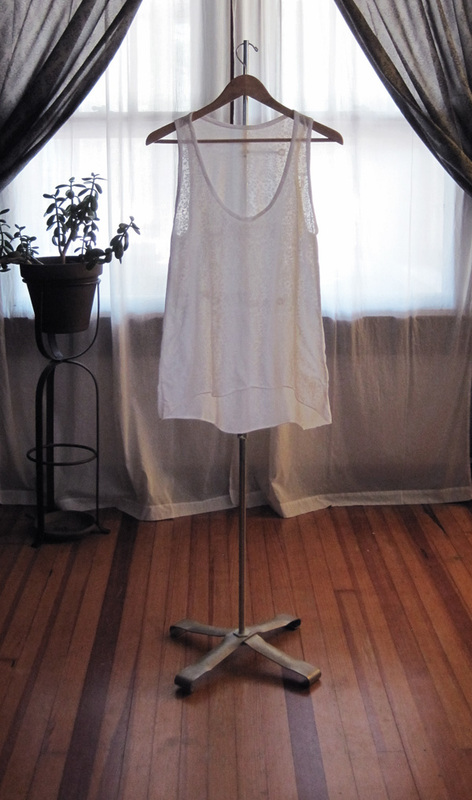 Using a tank top of a similar fabric weight and with a flattering cut as my template, I folded it in half and traced it roughly around the front and back sides. Then using my tools I carefully measured both sides, creating the back first, then the front based on the measurements for the back (making sure the shoulder seams would align, that the arm holes were the same height and that the length of the top was the same on both sides). 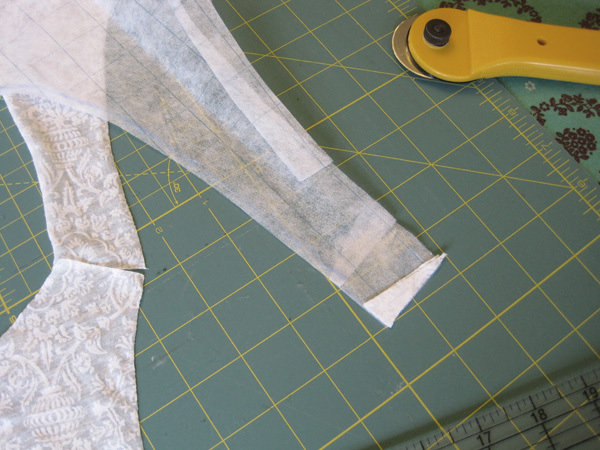 After cutting out the pattern and pinning it together to see how it worked, I made a few alterations to the pattern. Then after cutting out the fabric I had to make a few more alterations. I’m learning as I go. Also, I realize these pictures don’t serve as a full tutorial, but I wanted to capture what I was doing so that anyone who is on the verge of creating her own pattern might realize just how easily you can dive in and begin — and to highlight how forgiving some mistakes can be (below see how I Frankensteined that shoulder together). 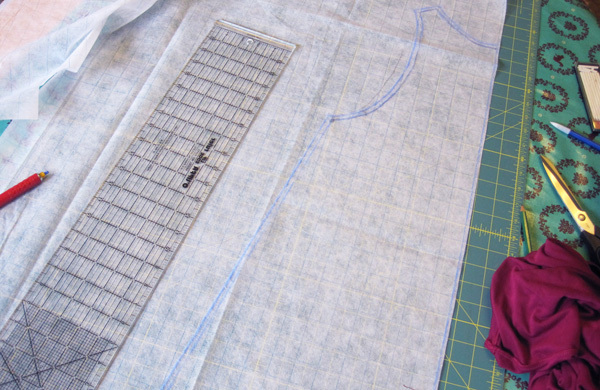 Of course, if you really want to start drafting patterns without using already existing clothing as your guide, I’d recommend Cal Patch’s Design-it-Yourself Clothes to help you along the way. It helps make sense of everything. Once I’d sewn the shoulder and side seams together with my serger, I cut the hem so that it was slightly shorter in front than in back. I left the hem raw and stretched it slightly so that it rolled. Then to complete the project I cut 1.5 inch wide strips to bind the neck and armholes. I pulled the fabric gently as I stitched the binding down with my sewing machine, keeping the binding from bunching or flipping outward. Because the binding is doubled over, it makes it heavier than the shirt so in the below images it flops over slightly, but when worn it lays flat on the chest and around the arms (at least on me — we’ll see how it fits my sister. We’re roughly the same size, but she’s got the whole burning 10,000 calories a day while living solely on camp food thing going for her.). At any rate, I’m really digging the finished product. 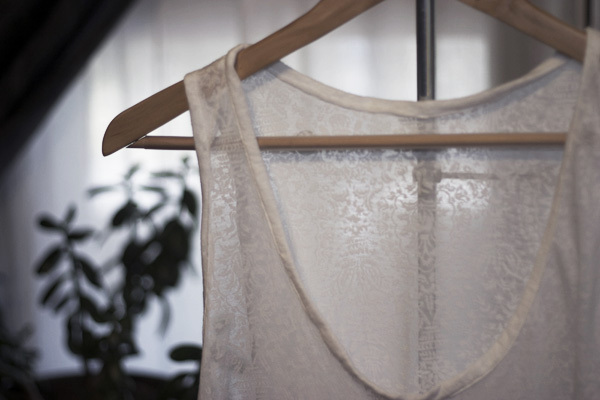 Lovely, lightweight and sheer. It’s so hot this summer that nothing else will do. Thanks, Patti! This is the style you want me to make for you in the black Aztec print, right? Cute tank! Just wondering – did you use bias strips, or on grain? Thanks! While I typically use bias strips when binding, I was being greedy with this fabric and tried to get all that I could out of it. So for this top I cut on the grain for binding strips. I think it worked because the fabric is so incredibly thin and forgiving.